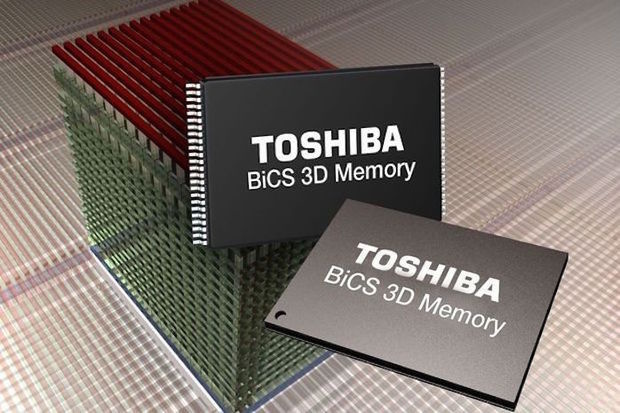 Toshiba Memory Europe announced the introduction of the fourth generation of its single package ball grid array (BGA) solid state drive (SSD) BG4 series at CES 2019. Toshiba Memory’s new line-up of ultra-compact NVMe™ SSDs places both the flash and an all-new controller into one package, bringing design flexibility to ultra-thin PC notebooks, embedded systems and server boot in data centers. The BGA form factor SSD enables larger amounts of flash to be added to smaller and thinner devices, and extends battery life to improve the mobile experience,” said Jeff Janukowicz, research vice president, Solid State Drives and Enabling Technologies at IDC. 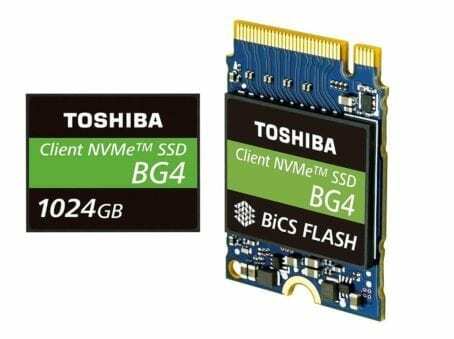 “NVMe™ BGA solutions, such as the new TOSHIBA BG4 series, provide OEMs with a better-than-SATA storage option that boosts demand for client SSD units. In fact, we expect this demand to increase at a 2017-2022 CAGR of 14 percent. 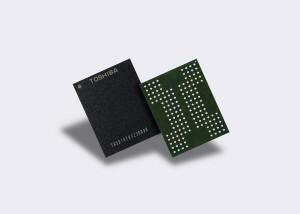 Toshiba Memory has long been at the forefront of delivering SSDs that enable smaller, thinner, lighter, and more power efficient mobile designs. The company was the first to develop a single package PCIe® SSD, and the introduction of the fourth generation BG series represents another pioneering achievement as the densest client SSD by volumetric measurements. 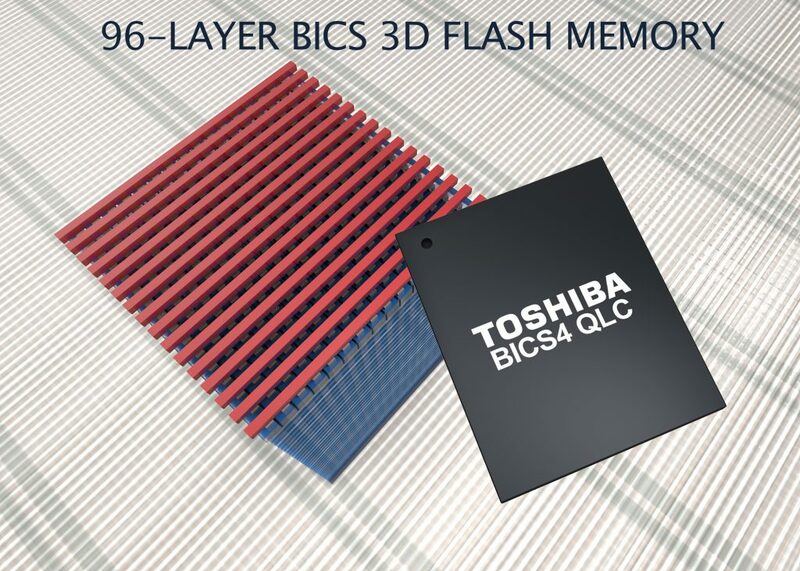 Utilizing Toshiba Memory’s innovative 96-layer BiCS FLASHTM 3D memory, BG4 increases the maximum capacity from 512GB to 1024GB (approximately 1TB) and provides a slim 1.3mm profile for capacities up to 512GB. Furthermore, the BG4 series doubles the PCIe Gen3 lane count from 2 to 4, delivering more performance in the same power envelope when compared to the prior generation product. The BG4 is set to rapidly replace SATA SSDs in notebooks and PCs,” said Paul Rowan, vice president of the SSD business unit of Toshiba Memory Europe. “Not only because of its performance that exceeds client SATA drives up to 4 times, but also because of its reduced power consumption and compact footprint. Compared to BG3 series, BG4 SSDs feature a power-saving solution that improves power efficiency up to 20 percent in read and 7 percent in write and provides a low-power state as low as 5mW. The BG4 also improved its Host Memory Buffer (HMB) technology by increasing the accelerated read access range and optimizing background flash management. Additionally, BG4 includes new enhanced reliability features to protect against host DRAM failures when using the HMB feature. Paul Rowan continues: “Toshiba Memory understands our customers’ needs to gain competitive advantage. The BG4 series, as a result, offers enhanced user-experience through an increase in storage capacity, significantly improved performance while prioritising power efficiency. Providing essential options for today’s mobile devices, Toshiba Memory’s new single package SSD is available in capacities of 128GB, 256GB, 512GB, and 1024GB (approximately 1TB), in either surface-mount BGA M.2 1620 (16 x 20mm) or removable M.2 2230 (22 x 30mm) module. Pyrite drive (version 1.00) or self-encrypting drive (TCG Opal version 2.01) models are also available. Toshiba Memory offers the industry’s broadest SSD portfolio, including a wide array of client SSDs. The BG4 series is currently sampling to select OEM customers, with general sample availability expected later in the second calendar quarter of 2019. During CES, Toshiba Memory America, Inc. will showcase the BG4 series in its private demo suite at the Venetian® Resort from January 8 – 11.